Powder Coating Turn-Key Coating Solutions: How Can it Help Manufacturers? Manufacturers don't have time stop and wait for their business partners to match pace. Manufacturers also expect results right there and then, not weeks from when a service was commisioned. What production companies do desire is a simple but elegant solution to a complex set of instructions. In the powder coating sector, that desire is answered by a turn-key solution that's bound to attract prospective industrial clients. From the pre-processing room to the curing oven, a complete system of powder coating equipment provides quality-assured line compatibility. The conveyor linkages and workpiece hooks move smoothly through various factory rooms. They carry those items into sealed powder coating cubicles, and batch process the products, as managed by a properly rated electrostatic power supply. Should the automated system issue an occasional hiccup, the turn-key system will yield to the actions of a repair engineer. All of the various equipment assemblies match, after all, as implemented by a knowledgeable supplier. Just imagine the opposite, an equipment line that mixes and matches the electrostatic gear and the curing oven. Potentially incompatible, a manufacturing partner won't embrace its powder coating equipment if it's continually out of service. Manufacturing plants begin as small-scale outfits, then they grow to become sprawling organizations. 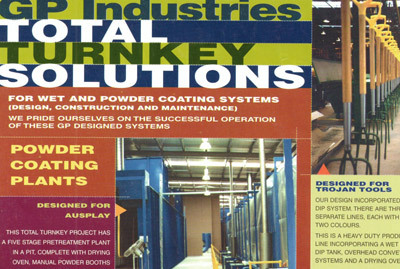 For the turn-key powder coating professional, growth is the goal. As such, branded cubicles grow modularly. A second or third curing oven goes in if the production floor continues to expand. The system, installed by an expert finish equipment designer, is first fitted on the floor as a compact line of powder coating and curing machines, but they're built to develop alongside a factory as it expands. 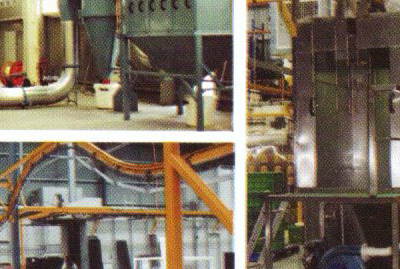 Unlike plain conveyor systems, production-based turn-key assets are optimizable. Stops can be incorporated into the line to manually inspect a finish. Side branches install to allow masking stations and quality control tables to inspect random product items. Fully automated or semi-automated, mainly because of quality control issues, the manufacturing line assembles as a knee-high series of belts and hooks. If forklift trucks and pallet lifters scurry across the high-traffic floorspace, well, whole-product equipment solutions can easily install as groups of overhead hooks, which are mounted on monorail conveyors. That's a perfect solution for a high-volume batch processing operation. It's like a giant jigsaw puzzle, deep inside the factory floor of a manufacturing plant. It's the job of a turn-key powder coating solution to solve that puzzle, to actually perform as the missing jigsaw puzzle piece. Moreover, that ideal production line solution has to be versatile, has to be expandable. 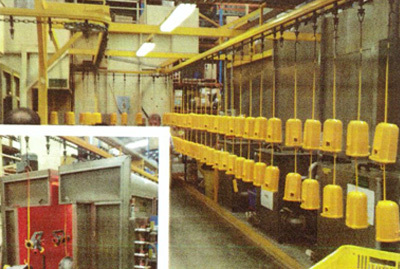 For the manufacturing sector, a truly unforgiving work domain, branded and modularly expandable powder coating systems work best.